Enjoy more than 1,000 videos! BMX, the universally popular extreme sports on your iPhone! We bring you cool videos and photos from the streets and race tracks of Europe and the US. Knock yourself out with awesome tricks! 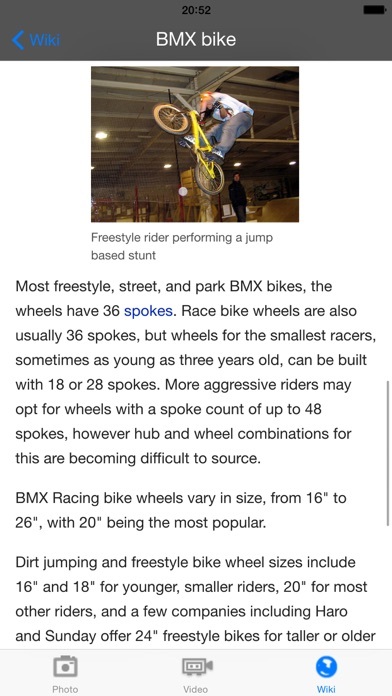 Aside from videos and photos, you can enjoy many other features including BMX Wiki. 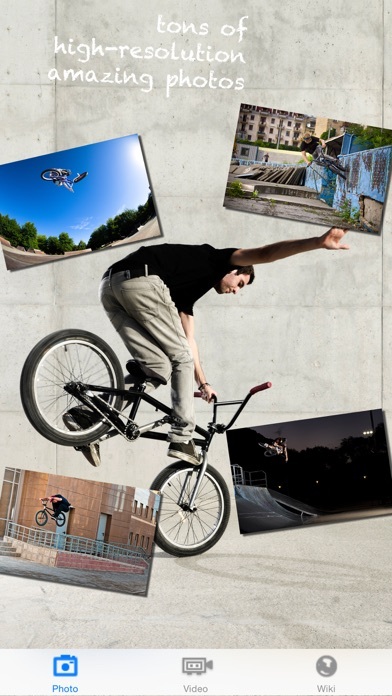 Features: 1) Tons of BMX photos 2) Over 1,000 BMX videos 3) BMX wiki library 4) Daily updated contents [Contents] Pickup Street style Freestyle Flatland Park Trails Vert Supercross Tricks - Grinds : Grinds Tricks - Grinds : Double peg Tricks - Grinds : Feeble grind Tricks - Grinds : Smith grind Tricks - Grinds : Luc-e grind Tricks - Grinds : Icepick grind Tricks - Grinds : Crooked grind Tricks - Grinds : Toothpick grind Tricks - Air : Tabletop Tricks - Air : Superman Tricks - Air : Barspin Tricks - Air : Tailwhip Tricks - Air : Backflip Tricks - Air : Frontflip Tricks - Air : Flair Tricks - Air : 180° Tricks - Air : 360° Tricks - Air : x-up Tricks - Air : Can Can Tricks - Air : No Footed Can Tricks - Air : Tire grab Tricks - Air : Tuck no Hander Tricks - Air : Turn down Tricks - Air : Crankflip Tricks - Air : Seat grab Tricks - Flatland : Decade Tricks - Flatland : Wheelie Tricks - Flatland : Endo Tricks - Flatland : Manual Tricks - Flatland : Bunny hop Tricks - Flatland : Footjam tailwhip Tricks - Flatland : Footjam Tricks - Flatland : Hang-5 Tricks - Flatland : Steamroller Tricks - Flatland : Whiplash Tricks - Flatland : Cliffhanger Tricks - Flatland : Hitchhiker and much more! *You must be connected to the internet to enjoy this app. So it seems like it would be a great idea, but this is either a cruel joke or an unsolved and fatal flaw. I think it is an unfortunate flaw, but every time this app is opened, it shows an ad, and as soon as that one finishes, it shows another and proceeds to do this indefinitely. I think the "x" in the corner of the ad is broken, and so when it is tapped, either proceeds to the app store or just launches another ad. Not cool. I'm just glad it was free and the error didn't cost me. Bmx world game of adds! So many times I've seen an add!! EVERY second it has happened. Every time I ex out of one it has another add👎🏿! It is a piece of poop!!!!!!!!!!!!!!!!!!!!!!!! !